The Berkley Flicker Rig Blades are a holographic blade that delivers maximum flash in a variety of light and water conditions. Deep cut Colorado blades provide enhanced water dispersion. The Flicker Rig Blades feature foil, vibrant colors and 3D eyes. 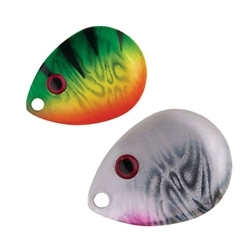 Premium slick blade finish combined with brighter colors provide a sharp contrast and a more realistic presentation.